This is how scientists could peer back. Inflation can help solve a variety of mysteries about the structure and evolution of the cosmos. For example, inflation would have evened out the universe's composition, explaining why it looks mostly the same in every direction. 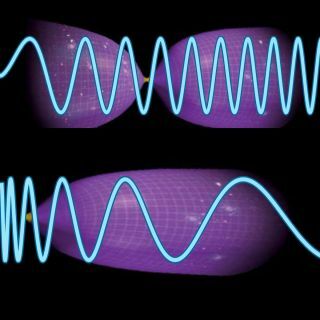 However, critics of the inflationary theory of cosmology argue that it requires unlikely starting conditions for the universe and that increasingly contrived models are needed for inflation to explain the latest data on the cosmic microwave background radiation, the universe's oldest light, said study co-author Avi Loeb, chair of astronomy at Harvard University. "The most natural, plausible models of inflation have been ruled out," Loeb told Space.com. "And a very flexible theory of inflation that can accommodate any scenario, where everything is possible, is a bit worrisome — the strength of a scientific theory is that it can predict certain outcomes and rule out others." Scientists have developed other, very different cosmological models that may solve the same cosmic mysteries that inflation does. For example, inflation assumes the universe began as a singularity, an infinitely dense point of matter and energy. In theory, singularities curve the fabric of space and time to an infinite extent, such that nothing existed before the Big Bang, not even time. However, another cosmological model suggests that the cosmos was born from a "Big Bounce," expanding outward after an earlier primordial universe collapsed. Like inflation, this model can explain why the universe looks the way it does, Loeb said. "Science makes progress with evidence, not belief, so we want to find clues to convince us that one scenario or another took place," Loeb said. If a primordial universe existed before our cosmos, our current understanding of physics suggests massive particles would have existed that would have oscillated at some regular frequency, like a clock's pendulum swinging back and forth. The fluctuations of these "primordial standard clocks" would have resulted in tiny irregularities in the density of matter on minuscule scales that would have become the seeds of structures on cosmic scales in our universe after it expanded. "If we imagine all of the information we learned so far about what happened before the Big Bang is in a roll of film frames, then the standard clock tells us how these frames should be played," study lead author Xingang Chen at Harvard University said in the statement. "If a pattern of signals representing a contracting universe were found, it would falsify the entire inflationary theory," Xianyu said in the statement. "We've identified observable details that could rule out inflation," Loeb said. "It's quite possible that inflation did take place, but it's always nice to have the ability to tell if ideas that are popular are also correct." The scientists detailed their findings in a paper accepted by the journal Physical Review Letters, which is currently available on the preprint website ArXiv.